Two hundred (200) submissions in two weeks. That’s how long the expedited process was for creating Singing Welcome: Hymns and Songs of Hospitality to Refugees and Immigrants. A single song can take years to write between the creation of lyricism and physical music. How did hymn writers from around the world create such a large volume of songs in such a short period of time? Brody is on the Executive Committee of the Hymn Society, a nearly century-old North American nonprofit organization. He said that the Singing Welcome collection took three months from the conception of the idea to the publishing of the songs. Brody recollected a personal experience in the SeaTac airport the day after President Trump’s travel ban was released, explaining a scene of police outfitted in riot gear and protesters that prompted the collection. “The first thing that came to mind is my passion for helping congregations sing their faith,” he said. From there, the Hymn Society took off with the idea. The working group that culminated the encouraging collection is nearly as diverse as the authors that contributed to it. Members included a Pakistanian pastor who started a church music school in Pakistan, an 80-year-old Catholic nun from Minnesota, an Evangelical Covenant pastor working toward a P.h.D. in worship in Chicago, a young Torontonian woman whose expertise is in global music, and a retired church music professor from a Baptist church in Alabama. Once the parameters for the project were established by the committee, submissions were collected and ranked through an anonymous process and the authors of selected submissions were contacted for minor editing. Many writers were impassioned by experience and definitions of faith. Brody said the importance of providing hospitality to refugees is an issue that has brought together a breadth of churches. Singing Welcome is meant to amplify a widespread positive response. Hamm has played the piano since she was young and has written hymns since 2001. She wrote three hymns — both the texts and the tunes for each — were completed prior to the Hymn Society’s request for submissions but all were inspired by immigrants and refugees. “My hope is that the hymns we sing in our churches will address the need for Christians to respond with ‘feet-on-the-ground’ faith to the crises of our day — poverty, inequality, racism, climate change and environmental degradation, xenophobia — and the resulting economic and political displacement of millions of people,” said Hamm. 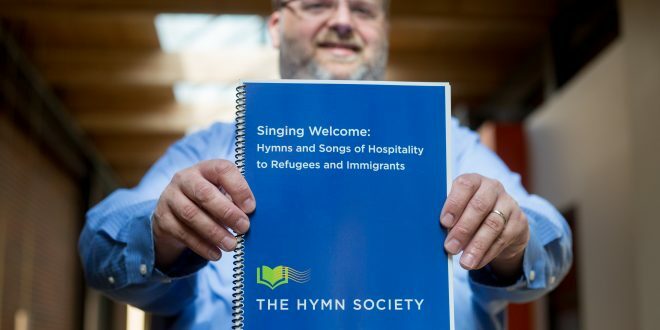 Singing Welcome: Hymns and Songs of Hospitality to Refugees and Immigrants was published by Hope Publishing Company and GIA Publications and is free for download on the Hymn Society’s official website. Libby Kamrowski is a senior journalism student at Gonzaga University.